Redirecting web pages becomes necessary when a web site is updated and old pages are replaced with new ones. This is very common when a site is upgraded to a CMS which typically displays pages as folders (i.e. www.website.com/about) as opposed to www.website.com/about.htm. Its important to redirect old pages to new ones because if the old page is bookmarked in a web browser, it will lead to a 404 error page and the user will probably not try to manually change the URL to go to the home page. Also, its better for SEO to have a consistent page structure in your site. The easiest way to redirect web pages is through the Management Console in IIS in Windows. Find the page you want to redirect, right click on it, and select Properties. This will give you the following dialog box. 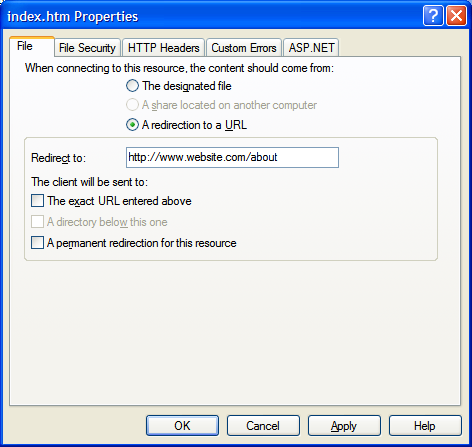 Select the A redirection to a URL radio button and enter the URL of the new page in the Redirect to textbox. Press the OK button to save the settings. When the page is viewed in a web browser, it will automatically redirect the browser to http://www.website.com/about.